It’s hard to believe it’s been a week since this all started. The majority of this week has been filled with tears, discouragement, worry and fear. It seemed the news and information we’d receive got progressively worse with each doctor’s visit. I’ve never felt so disoriented and not knowing which end was up or which way to turn. It’s so strange because you really don’t have time to process anything because everything is moving so fast. It’s like trying to drink from a fire hose. Yesterday, we had our first visit with the oncologist. In the waiting room I saw all these women who were in various stages of their fight. It was hard for me to believe that my wife, who looks healthy and well, will have to go through this herself. After a small wait, we were called into a conference room to speak with the oncologist. I will admit, I feared this appointment more than any other. I wondered if the pattern of bad news would continue, and if so, how bad would it be? But, the appointment I feared the most actually brought us some good news. The doctor looked Steph in the eyes and said he believed her cancer was treatable and possibly curable. With those words we felt a huge weight lifted off our shoulders. Now, for the first time in a week we have hope that we can win this fight. It’s amazing what a little hope can do. After the appointment I noticed Steph was upbeat and more like herself. And then, I heard her laugh. She has a contagious laughter that I’ve always found beautiful and attractive. After all we’ve been through this week, it was so wonderful to hear her laughter fill our house again. Tonight we decided we were going to go out as a family and have some fun. We went to Dave and Busters to eat, laugh and play games and not think about all this stuff for a little while. Tonight, I was reminded of how lucky and blessed I am to have such a wonderful wife and two amazing kids. Our evening was filled with lots of laughter – all because of a little hope. 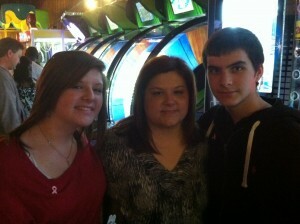 I am SO glad you had an awesome “family” day!! And I too love to hear her laugh…and I want to hear it friday… so just get ready….big hugs to all!! Love ya!